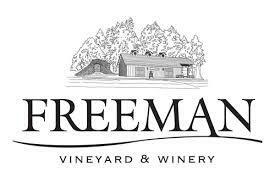 Freeman Vineyard & Winery was founded by Ken and Akiko Freeman in 2001. But the seed for Freeman was planted more than 15 years earlier, when Akiko and Ken discovered they shared a passion for a more elegant and refined style of Pinot Noir and Chardonnay. Though this style embodied elements of what they loved about Burgundy, Ken and Akiko believed California was capable of producing wines every bit as complex and compelling. This belief led them to explore more than 300 vineyards and vineyard sites, both in their search for grower partners, and in their quest to establish a world-class estate program of their own. Believing in a more eloquent, cool-climate style of winemaking, their searches led them to cooler hillside sites on the edges of modern California viticulture. Often swathed in fog and cooled by coastal breezes, these were vineyards that challenged the vines, where the yields were low and the fruit ripened slowly, producing wines of purity and consequence. From the very first vintage, the Freeman style went against convention. While others pushed the limits of ripeness, Akiko and celebrated consulting winemaker Ed Kurtzman sought balance and refinement. This approach has garnered Freeman international praise and a place on some of the world's most discriminating wine lists. It has also earned Freeman recognition as one of California's most visionary and acclaimed small wineries. Today, Freeman continues to be defined by the same beliefs that inspired its inaugural vintage. Whether they are working with legendary growers like Keefer and Heintz, or with Freeman's own, sustainably farmed estate vineyards in the Russian River Valley and on the extreme Sonoma Coast, Akiko and Ken strive for a virtuous and authentic relationship with nature. Robert Parker 90"Crushed flowers, autumn leaves, herbs and dried cherries waft from the glass in a delicate, intensely scented Pinot that impresses for its overall balance and harmony."